Had a trip to this fishery last Monday and had a great time. The owners, John and Amanda really looked after us well and I�m sure their hospitality extends to all their customers. 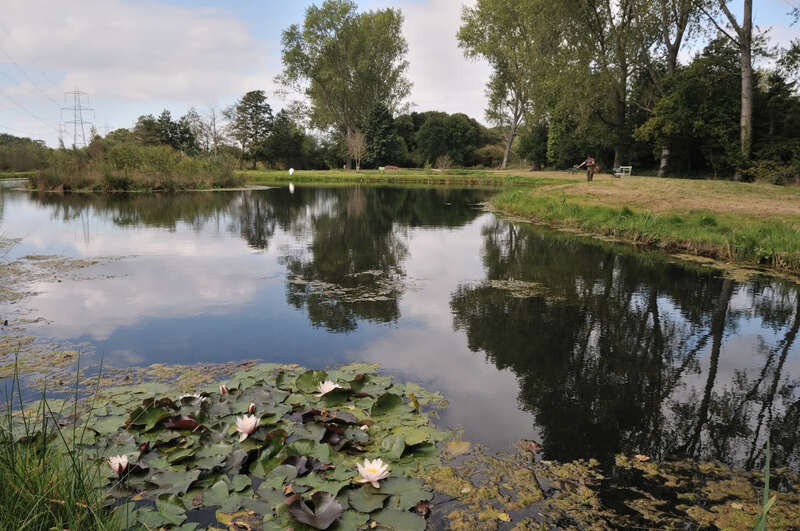 Woodington fishery is a mixed fishery which has 4 trout lakes and 3 coarse fishing lakes. You can choose between C&R and a 2 fish C&K tickets. 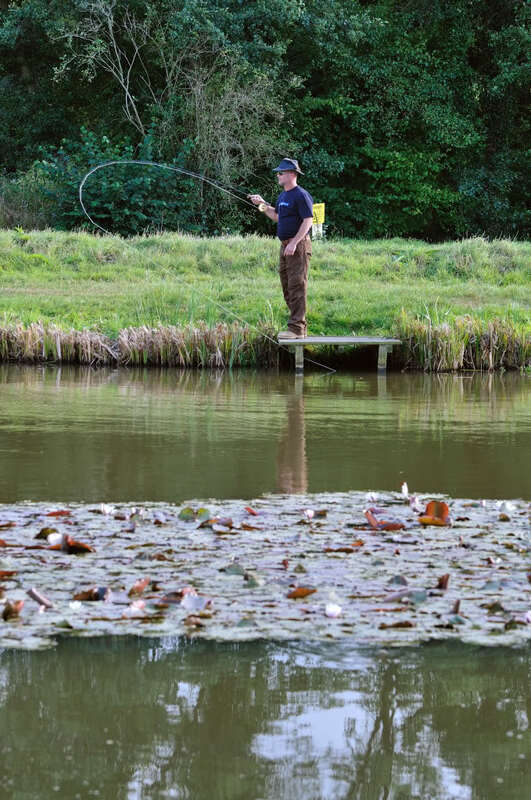 If you fish want to fish C&R only, then you are limited to 3 lakes, Kingfisher, The Leat and Sheerwater Lake. If you want to keep two fish then you can fish the 3 lakes on a Silver ticket or if you want to catch the bigger fish, then a Gold ticket allows you two fish from Spring Lake. You can then fish C&R for the rest of the day but there is no C&R from Spring Lake. There is also a well priced and well stocked tackle shop. Back to our day. We went last Monday 14th September and the weather was mostly sunny with a blustery wind. We were welcomed by John with a coffee and he told us how the lakes were fishing and what type of flies to use. We opted for the Silver ticket of 2 fish then C&R which didn�t allow us to fish Spring lake. We had a fairly late start so eventually started fishing around 11.00am and went off to Kingfisher Lake. The water was crystal clear and you could see the fish moving around. I had a few follows on a Daddy Long legs and decided to change to a green weighted Montana. After casting out and letting the fly sink, I caught a nice clean, fully finned rainbow of about 2lb which fought really well. I had a few follows after that but not much else. I think the bright conditions put the fish off. Kevin and Mick managed one each as well. We stopped around 1pm for lunch which Amanda cooked for us, a toad-in-the-hole with apple pie and ice cream to follow, delicious! After lunch, Kevin, Mick and Dave carried on with the trout fishing but I wanted to try the fly fishing for carp. I had already asked John if we could try fly fishing for carp and he said no problem at all. We had baited up a few swims with floating dog biscuits earlier on and I could see the carp moving around the lily pads. I set up a 9� #7 rod with a floating line, 7 foot 7lb leader and tied on an imitation pellet fly which I purchased from John�s well stocked tackle shop. John gave me a few hints. 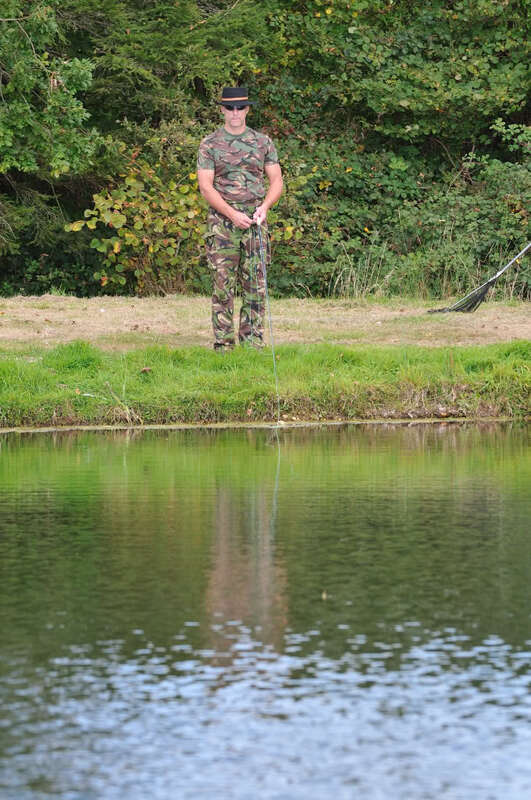 �Don�t strike straight away, the carp will nudge the fly a few times and if they think it�s ok, then they will take it but even then they might spit it out before you can strike. 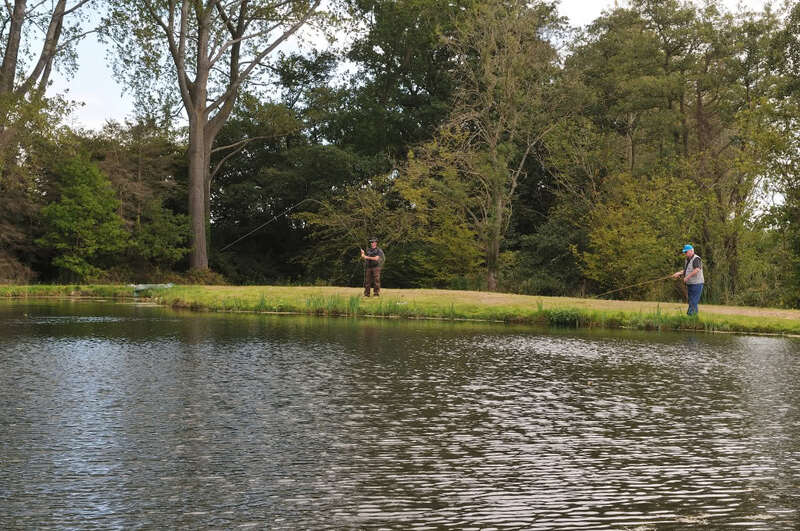 If you hook one, it will go straight to the bottom and you wont see it until you get it to the net� I fired out a few more pellets and waited for the carp to start to feed. It didn�t take long, soon enough, there was the familiar sight of big lips sucking in the pellets. I cast out to the nearest feeding carp, sank my leader and waited. Sure enough, as John said, the carp nudged the fly around, some took it and spat it out and obviously, I struck too early! It�s so hard not to strike when you see a carp sucking in your fly and you think you have it but it�s already spat it out! Truly heart stopping stuff! I eventually hooked one and it shot off like a train. I had a hard fight with this fish for about 10 minutes until I managed to land it. It was only a 5~6lb�er but it was a beautiful fish, fully finned and in great condition. I had disturbed the swim so I ventured off around the lake and saw some more carp cruising around and managed another two and lost one. I had loads of near takes and carp spitting out the fly but slowly the fish disappeared from this area so I went back to the lily�s and met up with the rest of the guys who had decided to give the carp a go as well. Mick and Dave had a imitation bread fly on and Kevin had the same as me. We all had takes and eventually Kevin hooked up but after a long fight, the fish swam under the pontoon he was standing on and swam away again wrapping the line around one on the legs of the pontoon! Needless to say he lost it! He did manage to land one later on though and with the sun-setting, we decided to call it a day. We all had a fantastic time and will certainly be returning for more fly fishing for carp next summer. 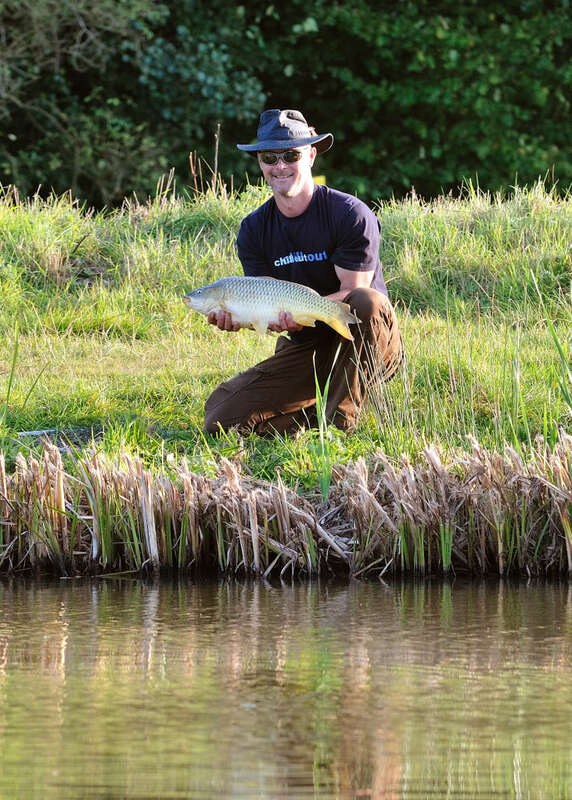 If you haven�t had a carp on the fly, I urge you to do so, it�s seriously good fun! We will also be going in the winter as you can also fly fish for pike in Clearwater Lake which is the largest lake at Woodington. 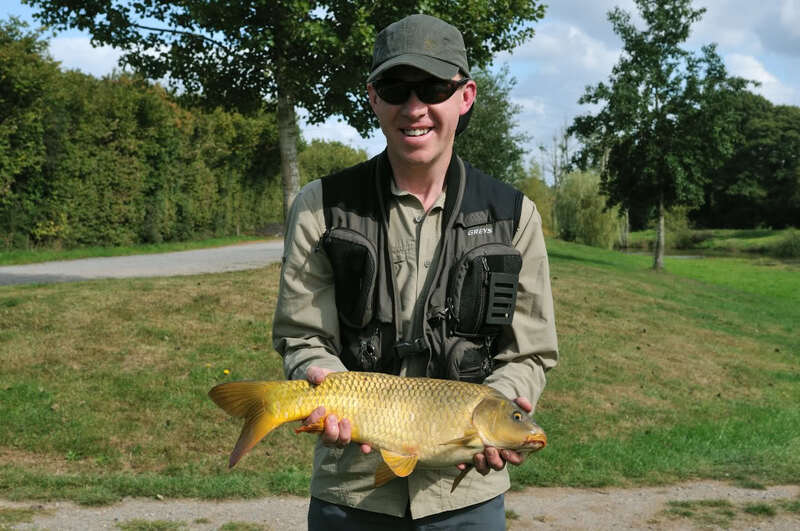 ME WITH MY FIRST EVER CARP ON THE FLY! DON'T LET IT GO UNDER THE PONTOON KEVIN! KEVIN WITH HIS FIRST EVER CARP ON THE FLY! I will second what Nigel has said,i was impressed with the set up there when we went last December. Yes the both Spring and Kingfisher lakes were weedy but John was just back from a weeks holiday and was rather embarrassed about it. He said that before he went away, both lakes were clear of weed. Spring lake was the worse of the two lakes. Leat and Shearwater lakes were free of weed but the same muddy colour as when we were there back in December. Fish were moving in both these lakes but I didn't fish them. I meant to say in my report that the carp were taken from the coarse lake in front of the lodge. 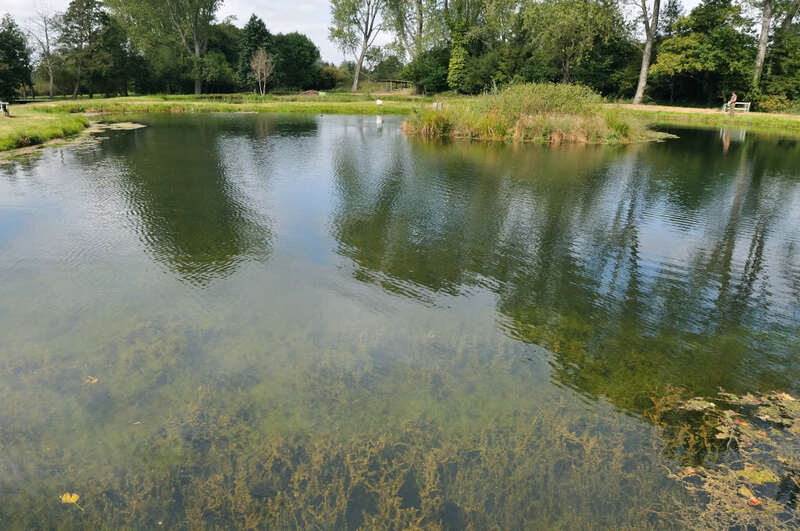 John did also say that if we were to get 10 guys together for a forum meet, he would close the bottom lake and we would have sole use of it for carp fishing ! I spoke to him earlier today, someone had a 15lb'er from the lake I was fishing!! 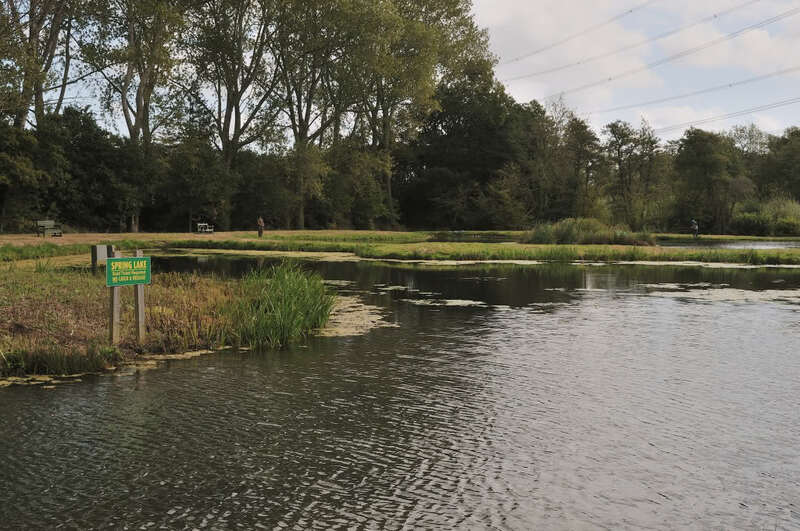 First 2 fish may be taken from Kingfisher, the Leat and Shearwater lakes followed by catch-and-release on the same 3 lakes (but not Spring Lake). 2lb to 5lb fish. 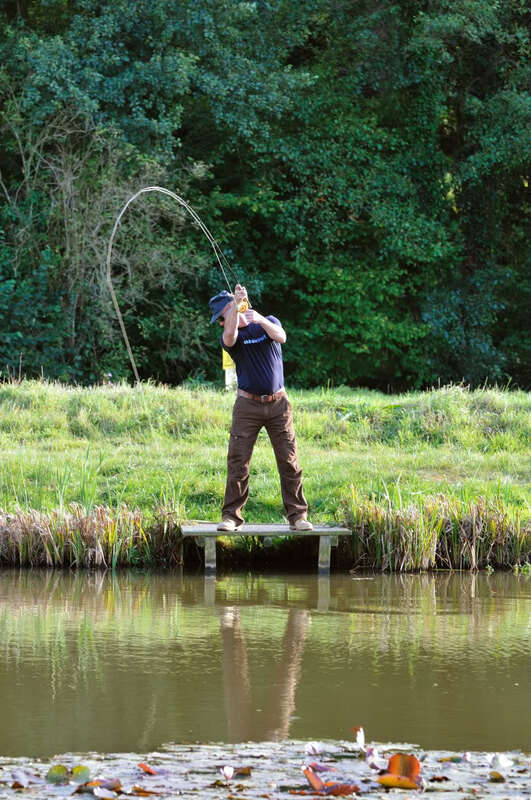 Catch-and-release fishing on Kingfisher, the Leat and Shearwater Lakes (but not Spring Lake). 2lb to 5lb fish. Why is the Bronze ticket more than the Silver ticket when you are not taking any fish, or is the Silver ticket not for 8hrs fishing? Yes, it's because John wants the stock to be turned around. He'd rather see some fish taken so he can replace them rather than having the same one's caught and caught again. That's why the Bronze ticket is slightly more expensive. Still cheap though for a days fishing! If you bank fish at Thornton a two fish + C&R all day ticket would cost �13, even with a boat for the day you would only pay �23.